Home > Fire Safety & EMS > Fire Extinguisher Inspection Tags, Labels & Fasteners > Instruction Label for ABC Fire Extinguisher With Hose - 3" x 5 1/4"
Home > Fire Extinguisher Inspection Tags, Labels & Fasteners > Instruction Label for ABC Fire Extinguisher With Hose - 3" x 5 1/4"
Instruction Label for ABC Fire Extinguisher With Hose - 3" x 5 1/4"
This pictorial fire extinguisher operating instruction label is for ABC Dry Chemical fire extinguishers with a hose. Label includes: 3 step instructions, with easy to understand graphics and fire classification symbols, A, B and C. Our self-adhesive vinyl labels are silk screen printed with fade-resistant UV inks to ensure long life. 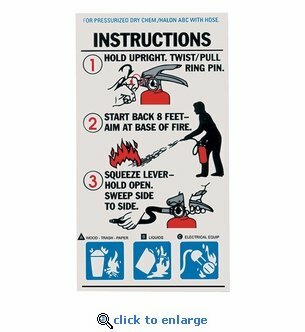 For Extinguisher Type: Pressurized Dry Chemical ABC fire extinguishers with a hose.